What parts of the visual system could be responsible for a fixed, monocular scotoma? Light enters the cornea, crosses the lens, hits the retina. Electric sinal travels from retina through the optic nerve, reaches the chiasma, crosses and makes its way to the visual cortex. My question is: given a fixed, absolute scotoma in one of the eyes, what parts of the vision could be at fault? Initially, I believe the cornea/lens couldn't be, otherwise the scotoma wouldn't be absolute and fixed. Moreover, I suspect that, after the chiasma, signals from the same visual position are joined, so, the problem couldn't be after it, otherwise the scotoma would be binocular. As such, am I right to conclude that a fixed monocular scotoma could only be caused by issues on either the retina, or on the optic nerve? 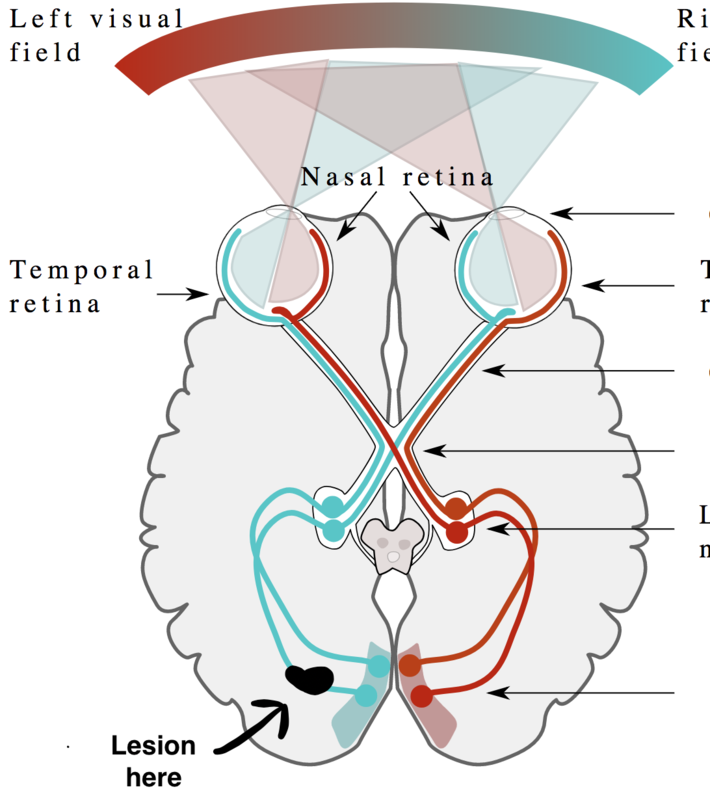 A scotoma only affecting one eye (i.e., one that is not perceived when one eye is closed) is diagnostic of a lesion upstream from the optic chiasm. See Brust's Practice of Neural Science, Fig. 3-2. The figure demonstrates a full cut, with complete blindness in one eye, but the principle is the same for a scotoma. Not the answer you're looking for? Browse other questions tagged human-anatomy neuroanatomy human-eye neurology visual-system or ask your own question. What processes are responsible for focusing on an image only seen by one of the eyes? What is the mechanism responsible for the 'delay' in delayed rectifier potassium channels? What happens when the congenitally blind brain receives visual input? 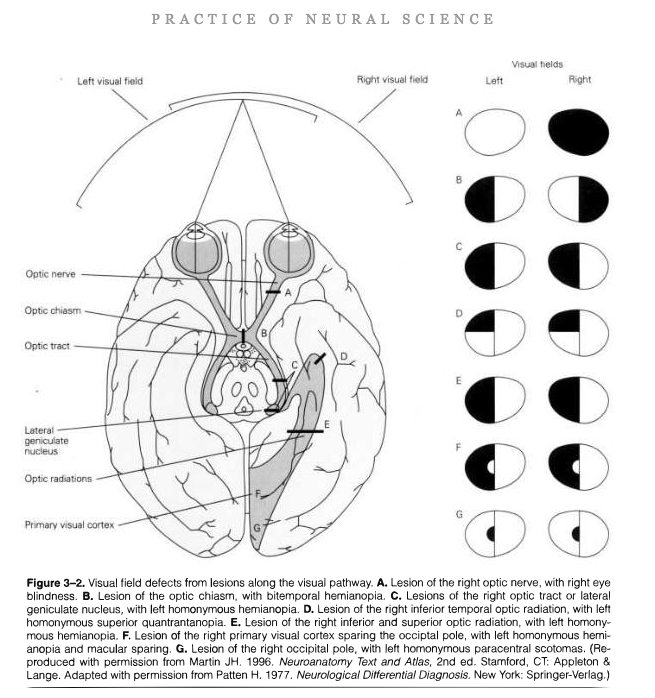 Does light from the left visual field reach the temporal left retina? What is the rest state for eyelids - Open or Closed? How is the “sampling time” of the human visual system influenced by things like hormones, metabolism, or our circadian rhythm?